Jerry Blue didn’t fit the mold. He was African American, he was huge, he thought that libraries were about ideas and learning and opening doors for people of whatever age or color or mindset. His stories will live in the minds of countless children who listened with rapt attention as he shared the wisdom of the stories. In recent times he was my neighborhood librarian. We talked at length of his plans to work with the community, to carry the message to those on the fringe – to seniors, kids, immigrant people, those who think they don’t deserve to know. He was a passionate believer in the role of the public library as an active player in the community. Jerry’s friends and especially patrons of St. Anthony, Sumner and St. Anthony are mourning his sudden death last week. Jerry Blue was a good man who made a difference in this world and in his community. Though he will be missed, his spirit is with us. One way that today’s seniors are exercising their independence, their concern for their own and others’ safety, fiscal realities or possibly family pressure to hand over the keys, is to embrace the car-free life. For the car-free there are great plusses matched by some obvious negatives, most keenly experienced in the perceived limits on daily routines that ensure healthy and happy independent living. The car-free life can put a screeching halt to daily routines. Seniors find themselves cut off from the essentials, particularly as health care facilities, churches, and grocery stores disappear from the neighborhood. Just as important to a rich and affirming life is the chance to participate in the fun stuff –family gatherings and grandchildren’s graduations, the coffee klatch, the golf course or the health spa, the library, the hairdresser, the ladies or boys lunch out, an OLLI class or to volunteer. Kay Anderson, Executive Director of Northeast Senior Services, 2580 Kenzie Terrace, Minneapolis, can spot a problem – and a solution – when she sees it. As is her way, she takes action. In this case, the result is a comprehensive guide to the transportation options of which many seniors and their families may not be aware. Her guide to locally accessible transit options is a prime example of a community-based response to mobility barriers that encumber, isolate, and distress seniors in the neighborhoods served by NES. Preparation of the guide involved making connections and phone calls, exploring and evaluating options, and carefully defining the service area of each provider. The results are posted in the most Late Spring 2012 issue of Northeast Senior Newsletter. Each item is well annotated with details about area service, reservations, fares, schedules and more. Meanwhile, here are the transportation links Kay has checked out. Though services and service areas vary, the scope of the list focuses on the NE Seniors neighborhood – NE and SE Minneapolis, St Anthony Village, New Brighton, Columbia Heights as well as services that reach target populations throughout the metro area. A personal note — What the guide doesn’t address and what this seasoned bus rider would add is that public transit experience offers a unique and awesome opportunity for lifelong learning – about people (some obnoxious, most generous and gentle – all interesting), about neighborhoods you’d never veer from the highway to visit, about the fortitude that people with disabilities demonstrate en route to their jobs, schools or to the library to do some research, and about the ways in which bus drivers give public service a good name by exercising unstinting grace under pressure. Recognizing that retirees and others “of an age” did not enjoy the advantage of on-the-job computer training a number of state and local agencies are working together and with public agencies including libraries to provide learning opportunities for seniors. Senior Surf Day at the St. Anthony Library is just one example of the opportunities available for seniors who want to know more about the web, search engines, senior-oriented Internet sites and more. There’s a Senior Surf Day scheduled for 12:30-2:30 p.m. Thursday, October 27, at the St. Anthony Library, 2941 Pentagon Drive in the St. Anthony Village shopping center. This session is sponsored by the library in collaboration with Senior LinkAge Line, the Minnesota Board on Aging and MSMP. There will be another Senior Surf Dday at St. Anthony on November 17. Questions? Call 612 543 6075. This session is one of scores of similar training sessions scheduled for seniors throughout the region and the state. For more information contact any one of the sponsoring organizations. Northeast Seniors programs, ranging from foot clinics to diabetic friendly appetizers, events calendars and housing tours are rich, timely, informative and fun. Staff, along with members and volunteers are gearing up now for the Fall Fundraising Dinner scheduled for Friday, October 7, 5:00-7:00 p.m. at Faith United Methodist Church, 2708 33rd Avenue NE in St. Anthony. The suggested donation for the Fundraiser is just $15/adult which covers the cost of hot beef sandwiches, dessert, beverage, entertainment and a basket raffle. A vegetarian option is available. Contact NE Seniors at 612 781 5096 or mail@neseniors.org. HCMC Clinic at St. Anthony Village: Windom Park residents and other Northeast residents have been watching with interest developments at the St. Anthony Village shopping center. Signs now answer that question as to what’s coming in – the St. Anthony Village, part of the Hennepin County Medical Center network, will open sometime in October at 2714 Highway 88, St Anthony. It is in the space formerly occupied by the drugstore and a tax service. Evening hours two nights a week, Tuesdays and Thursdays. Prenatal care and family planning. Care for all ages, including older adults. To follow developments at the new clinic visit the HCMC site. To get the juices flowing the St. Anthony Community Theater offers a three-performance run of The Sound of Music on the preceding weekend, July 29-31. The perennial favorite is set for 7:00 p.m. Friday and Saturday and 2:00 p.m. Sunday at the St. Anthony High School, 3400 Silver Lake Road Tickets are $10/adults, $8/seniors. 6:00 – Parade lineup 7:00 – Parade begins at the St. Charles Borromeo parking lot and continues St. Anthony Shopping Center, After the parade – Street Dance and CelebrationFeatured entertainer – Headpressure. Games, coloring contest, visiting dignitaries and a Bocce tournament at 9:00 p.m. Final performance of The Sound of Music – 2:00 p.m. The story of the Stinson Parkway Conservancy is one of beauty – elegant flowering trees, carefully tended gardens of azaleas, daffodils and roses, and committed neighbors. The neighbors share not only the love of beauty but the vision to imagine a reborn Parkway, the artistic sense to plan just the right colors and layouts to fit the space, the persistence to persevere against all odds, and the strength to haul hundreds of gallons of water to the arid median whose access to the pipes that once carried water to the median strip have fallen to rust and ultimate cut-off. The Stinson Parkway Conservancy is a charitable organization and has filed with the State of Minnesota and the IRS. To date the annual receipts of the Conservancy do not meet the minimum threshold set to require 501(c) (3) nonprofit status. Contributions are tax deductible to the extent of the law. The Stinson Parkway Conservancy has adopted by-laws and selected a board of community members headed by Lois Kelly, a long-time Windom Park resident and community activist. It was Lois who took action when she and others saw a need to create a Stinson Parkway deserving of its prestigious standing as part of the National Scenic Byway of the City’s Grand Rounds system. The political and financial history of Stinson Parkway is a story for another day; the fact is it has suffered from neglect over the years. Stinson Parkway is that .7 mile part of the Grand Rounds that connects St. Anthony Parkway with a unfulfilled vision, a section of the 50 mile Grand Rounds system that has yet to be. The South end of Stinson Parkway, at the crossroads with New Brighton Boulevard, offers a gracious welcome to a quiet residential community that includes the Windom Park and Audubon Park neighborhoods. That same gateway swings out of the neighborhood into the industrial strip of Stinson that once housed some of the City’s largest industrial giants, including Honeywell Aerospace in the more recent past. Stinson Parkway, and all of the Grand Rounds system, is under the purview of Minneapolis Park and Recreation which has long planted and maintained the brilliantly colored flowering trees that line the Parkway. Conservancy volunteers complement the trees with flowers and shrubs often contributed by local business and other organizations. Just this month the last of the flowering beds, including renovation of the gateway garden, were completed. The Stinson Parkway Conservancy welcomes visitors to the gardens and is happy to share information with to who may be interested in the project to maintain and enhance the Parkway and the Northeast neighborhood it serves. 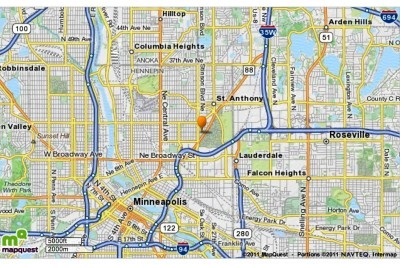 Contact stinsonconserv@gmail.com, find the Conservancy on the web at http://www.parkwayconservancy.org or call 612 781 9936. Contributions to the Conservancy should be directed to Stinson Parkway Conservancy, c/o 2243 Roosevelt Street Northeast, Minneapolis, Minnesota 55418. 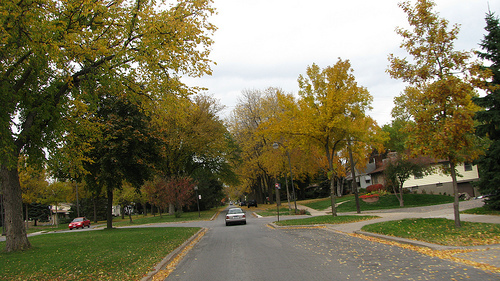 Most important, find time to explore Stinson Parkway and all of the magnificent parkways that shape and enhance Minneapolis as the renowned Grand Rounds, one of the nation’s premiere Scenic Byways. “Gerda Pulls Harder then the Horses” is the intriguing title of a story to be told by Larry Johnson as one of many features of the Environmental Fair at the July 17 celebration of Colonel John and Helen Stevens, pioneer environmentalists who helped to shape the profile of Minneapolis. The house that the Stevens built in the mid-19th Century still lives – just not where it was built. In the late 1800’s historic preservation called for the Stevens House to be moved to Minnehaha Park, a block south of the Falls, where it proudly stands to this day. Over the years its served the community in a mix of ways including years as a public library, now the John H. Stevens is designated as an historic site open to the public for tours. So how does one move a house in 1896? That’s where Gerda comes in! On May 28, 1896, 7000 Minneapolis school children actually pulled the house from the West Bank downtown to Minnehaha Falls. That’s the story Larry Johnson will tell at the Stevens House at 1:30 on Sunday, July 17. During the storytelling session children will enjoy a chance to calculate their own horsepower and to play with old time toys that do not leak mercury into the environment. Storytelling is just part of the Environmental Fair at the Stevens’ House from Noon to 4:00 p.m. At 2:30 Jerry Foley will talk about natural plant medicines and the Stevens’ role in promoting early growing in the state. Throughout the afternoon the yard of the Stevens House will be dotted with tables for current environmental groups including Gardening Matters, Transit for Livable Communities, the Bioneers and others. The Environmental Fair is free; tours of the Stevens’ House are $3 for adults or $1 for children. The John H. Stevens House is at 4901 Minnehaha, right in Minnehaha Park.